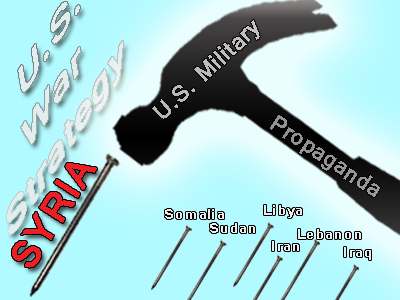 GLOBAL POLITICAL AWAKENING: Strategy Revealed: Make Syria "Look Like a Nail"
Strategy Revealed: Make Syria "Look Like a Nail"
The Obama speech is done. Those hypnotized by his lies ponder his message. The U.S. has the "authority" to attack ISIS/ISIL. The U.S. will enter the sovereign nation of Syria without permission because apparently it doesn't need permission. Obama in his usual deceptive talk, had the usual smirk on his face as he narrates his role in the now well established global empire of oppression, the U.S. empire. The new world order is here. Spread the word. The mass psychopathy is at an all time high, only this time there is no one to stop this violent empire. Is there anyone out there who can play moral police and help turn this thing around? If so, now is the time to act. I guess if the only tool you have is a hammer, every problem has to look like a nail. And with this monumental confession we can be 100% sure of what the plan all along since 9/11 has been. To unfairly, deceptively, maliciously and falsely accuse seven countries of harboring special weapons or training terrorists; or terrorism in one way or another to create the false narrative to the American people that each country needs to be attacked. There is no debate to this day about what general Clark meant or what the plan was. The pretext for the invasion of these seven countries would have to be worked on, thought out, and carefully implemented in real-time using whatever the option is at that time. If you are in charge of the CIA, at that point you KNOW that your services will be needed. "Aye sir, let us know when you need us" is how the CIA would have responded to this knowledge in 2001. And with that, fast forward to present day. Here we are buying into these convenient narratives that just happen to amazingly fit in perfectly with these clearly stated goals of the Neocon globalists. Oh why in the world would we believe this? And why would we ever go for this trick again? Isn't this a basic violation of common sense? We the people of America and the world have all the evidence we need to show long-term intent on the part of those in charge. Imagine this was a court trial to convict all the criminals in Washington D.C. (and this should be the case). This is a significant and damning piece of evidence. One thing that the warmongering U.S. think tanks have never been able to do is to hide their intent. They always create new narratives and propaganda campaigns in an attempt to whitewash their original stated goals and, as always, mainstream media plays a crucial role in pushing these false narratives to gain the support of the majority of Americans, mostly conservative Christians and Zionists who believe mainstream media news. Despite their obvious lies and stated intent, however, they seem to have a powerful grip on this core of American minds hypnotized by whatever messages the government wants to give them. This hypnotized component of humanity (make no mistake) is the segment of humanity that threatens the entire human race at this point in history. This segment of humanity (asleep, believing mainstream media news) doesn't see the "nail" that general Clark was speaking about. Somehow they DON'T see the irony and the timing of the news put out by the U.S. Empire. That the mainstream media is concentrated to just six corporations does not phase them. Perhaps since they own so many other smaller channels, this is what makes the illusion more believable to them. Any cognitive thought about this would ruin their paradigms and leave them feeling empty, lonely and afraid of the (real) world. So while the U.S./Mainstream media lying machine admits that the U.S. has been arming and funding "moderate rebels" who have been illegally opposing the sovereign government of Syria, they completely ignore that there is no such thing as "moderate rebels", and they completely ignore that this narratives describes ISIS exactly. That U.S. weapons are comfortably in the hands of ISIS is seen by the mainstream media believers and the U.S. Empire's talking heads as a mere unlucky coincidence not to be thought-out or analyzed any further for fear of drifting into "conspiracy". All along, the U.S. government, their powerfully deceptive Intelligence operation known as the CIA, and all their working propaganda mouthpieces known as mainstream media, continue to march to the exact same beat as the Bush administration. As if humanity didn't already figure out 9/11. As if humanity is stuck in 2001 consciousness. As if humanity has not progressed at all over the last 13+ years, the CIA-controlled disinformation system marches forward unfazed by the blatant lies and the level of insult it is laying on humanity. Government consciousness insulting humanity, that is what we are seeing now. Humanity is now feeling insulted by this old and ancient, primitive consciousness that would have us suspended in time. Government apparently declares all knowledge obtained since 9/11/01 null and void. Government consciousness and the awakened segment of humanity are now in a divorced state, each fighting for the remaining (third) segment of humanity (those asleep) to join it - and each getting bolder at what it does. Will anyone ever trust government again given what we are seeing now? Is government playing their last hand? Can they sustain their deception? And if so, for how long? A government so deeply entrenched in its own propaganda that it doesn't seem to know how to stop is something of a wonder. This is an empire that has toyed with the use of words to the maximum capacity. We have created the concept of "combat troops" versus NON combat troops, of "moderate" rebels versus "extreme" rebels without any real distinction on a physical and practical level. We have Middle East "experts" tell us what is REALLY happening in the Middle East. Reports are spun together by these "experts" who always seem to have a book written so they are given red-carpet treatment at all the mainstream media networks to come and give us their "expert" report on the Middle East. The script has played out over and over and over again, yet some Americans keep falling for it. So as the U.S. Empire prepares to continue its plan clearly outlined by The Project For The New American Century, Americans sit listening to the latest Obama speech promising new war in Syria wondering what will happen next. Perhaps it is time to believe general Clark, perhaps it is time to read the prophesies left to us by the Bush Neocons. If you read their stated intentions you will finally know and understand what they will do next. Do you agree with the Project For The New American Century? Do you agree with U.S. continued aggression against sovereign nations? Do you want to believe the ISIS psyop? Do you hate Muslims and spread Islamophobia? Then the criminals who run this country need you. Join them and announce your allegiance now. More than ever America and humanity needs to know who is with us and who is against us. This is about preserving humanity and restoring America and what it used to stand for. This is not about Islamophobia, believing Pentagon and CIA lies, believing government "expert" reports or listening and believing whatever Obama says in front of the teleprompter. Too many well-intentioned Americans who love liberty and truth continue to fall for the Pentagon/CIA pro-war narratives. Are YOU listening and believing a news site that continues to push the pro-war narrative consistent with general Clark's "look like a nail" confession about the seven country takeover? Then it's time to change your source of news. When looking at the news every day, everyone must know the truth about the current global agenda FIRST. Then judge the news based on this knowledge. Too many Americans, including many who follow alternative media, believe the narrative first THEN try to see if the their stated agenda can be PROVEN to fit. Wrong I say! You must first understand the highest and stated agenda. Then you will see how easy it is to identify all of their lies. How easy is it to identify their lies? Don't forget, they were the ones who decided to cut away on the image right before the James Foley beheading. They were the ones who showed the attacker moving his hands many times on Foley's neck without a single drop of blood. They were the ones who created the James Bond of terrorism, ISIS, with amazing communication abilities, immunity, production equipment, endless food supply, world-class counter-intelligence, James Bond-like anti-surveillance and super classy editing skills. They were also the ones who created the "pile driver" theory to explain the WTC collapse on 9/11/01 that directly violates Newton's Law. They created the Iraq WMD hoax, the babies in the "incubators" Kuwait comedy, the Syria "chemical weapons" hoax, the MH17 busted false flag, and on and on. These sloppy displays of events are only designed to fit into their stated long-term plans. They get how well mainstream media propaganda works. They get it that as long as well-meaning Americans, both Christians and Jews and others, continue to believe mainstream media news, we will continue in this game of survival of the human race against the oppressive force of government. Until something changes dramatically, it is up to us to do whatever we can to share this information. Obama holds the hammer in his hand, which is the powerful (U.S. tax payer funded) U.S. military. And he has now announced that Syria looks like a nail. A lot of us get it, Mr. Obama. We get the strategy. It is not a very complicated one. We also know that the strategy doesn't work without mainstream media's constant lies and propaganda. For this reason I have often referred to mainstream media as the greatest threat to freedom and humanity. This is history in the making. Ask yourself, which side of history are you on? As times get worse and the U.S. Empire destabilizes one country after another and murders more and more people all around the world, ask yourself,How much is too much? When will you finally start questioning those U.S. Army commercials on TV? When will young men all over America look their favorite U.S. Marines, Navy or Air Force recruiter dead in the face and say: "No thanks, I'll pass"? When will we have enough of these endless wars of aggression? When will young men stop and consider how these violent pro-war, pro-murder video games might be part of the long-term plans? When we are ready and enough of us have had enough, I believe everything will start with a criminal database to document all the events of the last 13+ years. Think of it this way, there is an existing unofficial list of war criminals walking free among us. How long it takes to put those people behind bars is up to us. If enough of us are fed up that will happen sooner rather than later. (By the way, this scenario is much easier to imagine when you shut off mainstream media news). Until then, those that are still asleep in the matrix will eventually face an uncomfortable circumstance when they will be forced to see the truth. Let us hope that we are not all long gone before this happens. If the degree of overall survival of the human race is dependent on those who are asleep and believe mainstream media news, then that almost guarantees a massive loss of life globally. If, however, this third and final segment of humanity (those still asleep and believing mainstream media news) experiences a significant loss of membership, that alone could be the trigger that releases the joy, the energy, the potential and the grand awakening humanity has been seeking for a very long time. Remember, with every person who begins to think on their own we are one step closer to a happy ending. Happy ending that is, for those of us aware now. For others, like the younger generations and those not born yet we are restoring the innocence that some of us enjoyed growing up. The perception of peace and good will that many of us grew up believing in. It's the neutral peaceful state of existence by which the average person feels that sublime sense of freedom and liberty. Don't you want to give this gift to some unborn child out there? I do. Agree? Then help spread this message to others who are still not sure and who are wondering what in the world is going on.